This post originally appeared on my previous blog in 2007, and was moved to SBBN in 2008. In October, 2008, I received a lovely email from Harry Morgan and Eileen Detchon’s grandson Jeremy Morgan, who confirmed that the photo of Mildred Potter in “M*A*S*H” is indeed his grandmother, Eileen Detchon. I would like to again thank Jeremy Morgan for his email and for the confirmation! In the meantime, here is the detective work I originally did, if you call reading a post by Larry Gelbart and fiddling around with photo editing software “detective work”. Basically, what you should get from this post is that if anyone tells you that photo is Spring Byington, they’re wrong. Jeremy Morgan and Larry Gelbart said so. 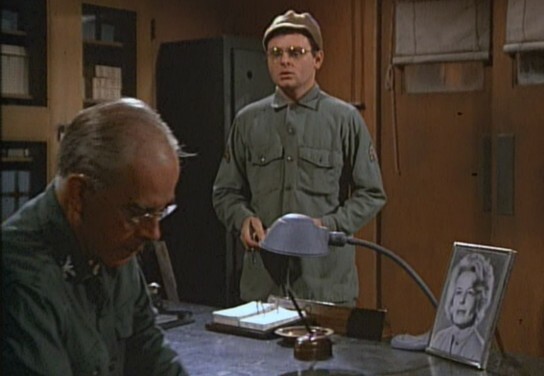 Fans of the show “M*A*S*H” will remember Col. Potter’s photo of his dear wife Mildred, placed on his desk the first day he arrived at the camp, and which remained there until the war was over. For years I’ve heard that the lady in the photo was actress Spring Byington. Byington and Harry Morgan, who played Col. Potter on “M*A*S*H”, were both in the television show “December Bride”, which ran for five seasons in the 1950s. Because there was a link between the two actors, and not being that familiar with Spring Byington, I assumed the rumor was correct. Until I saw Ms. Byington in more films, that is. Recently I took a good look at the picture of Mrs. Potter during a “M*A*S*H” rerun and realized that it’s not a photo of Spring Byington at all. In the interest of research with more than a hint of silliness, I’ll compare the two. The photo at the beginning of this article is from the episode “Dear Mildred”, the 7th episode of season 4. This is the episode where Colonel Potter, new to the 4077, writes home to his wife on their anniversary. Frank and Margaret, in an epic attempt to kiss up to the commanding officer, have a bust of Potter commissioned by a local artist (played by the inimitable Richard Lee-Sung) as an anniversary gift. Radar wins the day, though, by presenting Colonel Potter with Sophie, the horse. This second photo is of Spring Byington in the 1960 film “Please Don’t Eat the Daisies”. Byington plays Suzie, mother of Doris Day and, of course, grandmother to her four rambunctious sons. This was Byington’s last film; she appeared in several television shows until the late 60s, and passed away in 1970. I chose “Please Don’t Eat the Daisies” because Ms. Byington’s age seems to be about the same as the age of the woman in the photo of Mildred Potter. While I see similarities, the two actresses are not the same. Larry Gelbart said in this Usenet post from 2000 that the photo is of Harry Morgan’s first wife. According to the IMDb, that would be Eileen Detchon, a stage actress. I was unable to find any photos of her to make a full comparison, but I’ll take Mr. Gelbart’s word for it. The photo is of Eileen Detchon, Harry Morgan’s first wife. I read Verna Felton. I can’t find any photos of Eileen. That photo is indeed Eileen Detchon, Harry’s first wife. Also, if you look on the wall behind his desk, you’ll see a childs drawing of a horse, drawn by his eldest grandchild, Jeremy Morgan. Small trivia, but fun nonetheless! Hello all — I’m sorry anonymous #1 and mistress s for not responding earlier. Yes, I am nearly 100% sure the photo is Eileen Detchon, although there are a lot of people online and off who think it’s someone else. Everyone wants to know who Mrs. Potter is! I recall the drawing of the horse, anonymous #2, thank you for the trivia! Very interesting! I am a genealogist for Eileen Detchon’s family. I have lots of info on her line if anyone’s interested. I’d love to read what you’ve found.